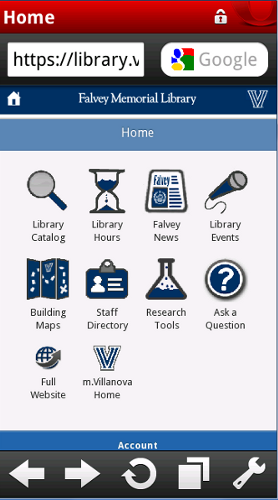 We are proud to announce that as of Monday, Jan. 28, 2013, the mobile version of the Falvey Memorial Library website is officially live. The goal of this project is to provide information in a more readily accessible form for mobile users than is provided through the main library website. As such, the mobile site allows users convenient access to the most frequently used services on the main library website, including catalog search capabilities, library hours, building maps, news and events, and interactive research assistance. Falvey's mobile website homepage, as seen from a mobile device. The library's main website homepage, as seen from a mobile device. 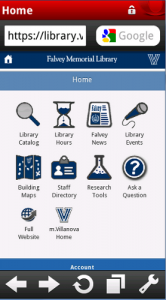 When you access Falvey through a mobile device, the library homepage should detect your device and automatically send you to the mobile version of the website. Users who prefer the main website over the mobile site can still access the main site by clicking on the “Full Website” icon at the bottom of the homepage. 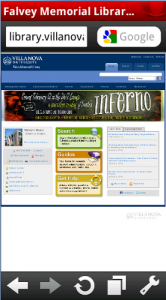 If you’d rather access the mobile site directly, http://m.library.villanova.edu will take you directly to the mobile content. 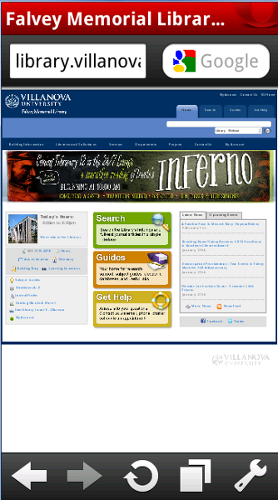 The mobile website also showcases the capabilities of the VuFind open-source, library-search-engine software (developed here at Falvey Memorial Library, Villanova University). The mobile website was, in fact, developed on top of the VuFind software and uses the built-in mobile version of its catalog-searching capabilities. As Falvey recognizes that mobile devices are becoming an ever greater percentage of its user base, the Library is dedicated to providing the best service possible to this market. As such, the Library will continue to develop applications and services for the mobile community, and work towards improving the mobile user experience. For more information, or to offer comments or suggestions, please feel free to contact the library technical team at libtech@villanova.edu.